Anne Frank's faith in humankind, even when faced with the evils of the Holocaust, has become a beacon of hope for millions of readers in the decades since her tragic death. 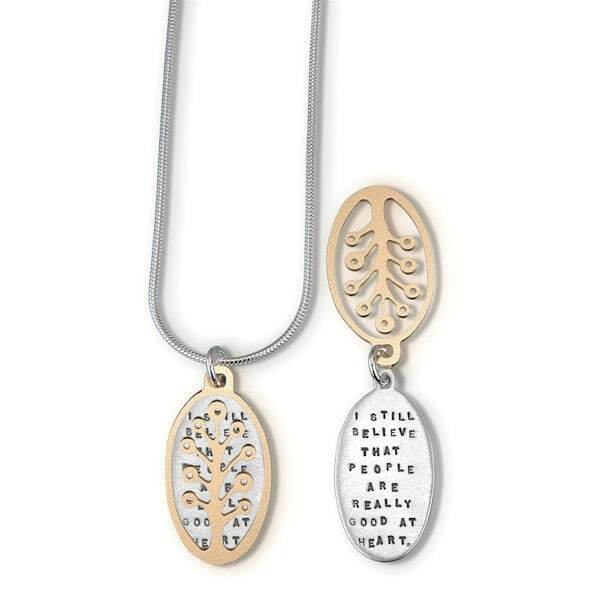 Her words of optimism elevate this beautiful accessory, the quotation hand-stamped onto a sterling silver plate and peeking through an elegant tree die-cut into a 22-karat-gold-plated brass overlay. Wear it close to your heart as a daily reminder of the goodness in the world! Pendant measures 1"x½" and hangs from a 18" sterling snake chain.